Need to send a suitcase? My Baggage provides a low cost luggage courier service for students, holidaymakers, business users, armed forces, expats and more. If you need to transport your luggage across the UK or worldwide, My Baggage’s suitcase courier service can get your luggage to its destination quickly and safely. Why Use My Baggage To Courier Your Suitcase? Low prices. It costs from just £16.99 to send a 30kg bag. Easy online booking saves you time. Door to door collection and delivery service for added convenience. Full online tracking gives you extra peace of mind. Fast delivery. Express services available. You can send suitcases of all weights and sizes on My Baggage’s flexible service. We provide a handy ‘size checker‘ which ensures that your case is within our limits. Another great reason to use My Baggage is our generous weight allowance. We allow you to send up to 30kg per item – that’s up to double the weight permitted by most airlines. You can send as many items as you like on our service. We know that when forwarding luggage, time is a top priority; no one wants to wait around for days or even weeks for their suitcase to arrive. For that reason, My Baggage offers fast delivery times of 1-2 days within the UK (depending on whether you select Express or Economy) and 1-5 days internationally, depending on your route. We also provide full online tracking, so that you can monitor your shipment every step of the way. To see delivery times for your suitcase shipment, get a quote from us any time! When booking a luggage shipment with My Baggage you can be sure that your belongings are in safe hands. My Baggage transports suitcases around the globe every single day. Our door to door service and full online tracking offers that extra peace of mind and our text and SMS alerts keep you updated every step of the way. 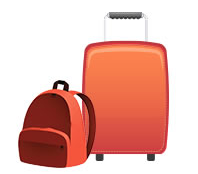 My Baggage provides £100 free compensation cover per item you send with us. If you wish, you can increase this amount up to the value of £1,000 for a small additional fee during booking. Before choosing your level of cover, we recommend taking a look at our list of prohibited and non-compensation items. With My Baggage you can send your luggage throughout the UK or to 200+ countries worldwide at a great low price. When sending a shipment internationally with My Baggage, you can still expect the same door to door service, online tracking and great low price. 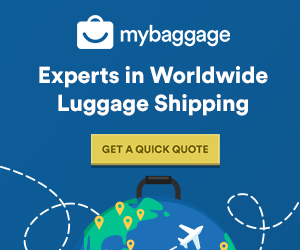 Get a quote for your suitcase shipment any time!